The brain is comprised of nerve cells as well as other cells that support and protect the nerve cells, called glial cells. Most brain tumors are named after the cells from which they develop. A tumor derived from glial cells is known as a glioma. Astrocytomas, ependymomas and oligodendrogliomas are all types of glioma and they are named after the cells from which they originate: astrocytes, ependymal cells and oligodendrocytes. A mixed glioma is a malignant tumor that contains more than one of these cell types. The most common site for a mixed glioma is the cerebrum, the main part of the brain. Like other malignant tumors it may spread to other parts of the brain. The initial symptoms of brain tumors, such as headache and nausea, usually are the result of increased intracranial pressure caused by the bulk of the tumor or a backup of the cerebrospinal fluid that surrounds the brain and spinal cord. Glial cells are widely distributed throughout the central nervous system, so these tumors can occur in a wide variety of locations, and therefore can cause a wide variety of other symptoms. A tumor of the frontal lobe of the brain may cause gradual changes in mood and personality. There may also be paralysis on one side of the body (known as hemiparesis). A tumor in the temporal lobe of the brain may cause problems with coordination and speech and may affect your memory. If the parietal lobe of the brain is affected, writing and other such activities may be difficult. Hemiparesis may also be present. Imaging studies are the key component in the diagnosis of most brain tumors. Currently, magnetic resonance imaging (MRI) is the best available imaging modality. Computed tomography (CT) scans also are used. For either study, an agent that provides contrast in the image is administered intravenously so neurological surgeons can visualize the tumor against the normal brain in the background. In some cases, neurological surgeons may employ an MRI scan with frameless stereotactic guidance. For this study, a contrast MRI is performed after special markers (called fiducials) are placed on the patientís scalp. The fiducials are processed by a computer, which calculates the location of the tumor and creates a three-dimensional reconstruction. This image then is used at the time of surgery to help locate the tumor precisely, maximize tumor removal, and minimize injury to the surrounding brain. To give an exact diagnosis, a biopsy (sample of cells from the tumor) is sometimes taken, then looked at under a microscope. The biopsy involves an operation. Your doctor will discuss with you whether this is necessary in your case, and what the operation involves. Where possible, surgery is the first form of treatment for a mixed glioma. Surgery involves the resection of the tumor to decrease the pressure it exerts. The aim of surgery is to remove as much of the tumor as possible without damaging the surrounding brain tissue. Depending on the size, location and spread of the tumor, it may not be possible to remove it completely and further treatment may be given as a follow up to surgery. For most gliomas, however, surgery will not provide a cure by itself. When a tumor is removed, it can be examined under a microscope to provide an accurate diagnosis so the next steps in treatment, which may include radiation therapy or chemotherapy, can be determined. 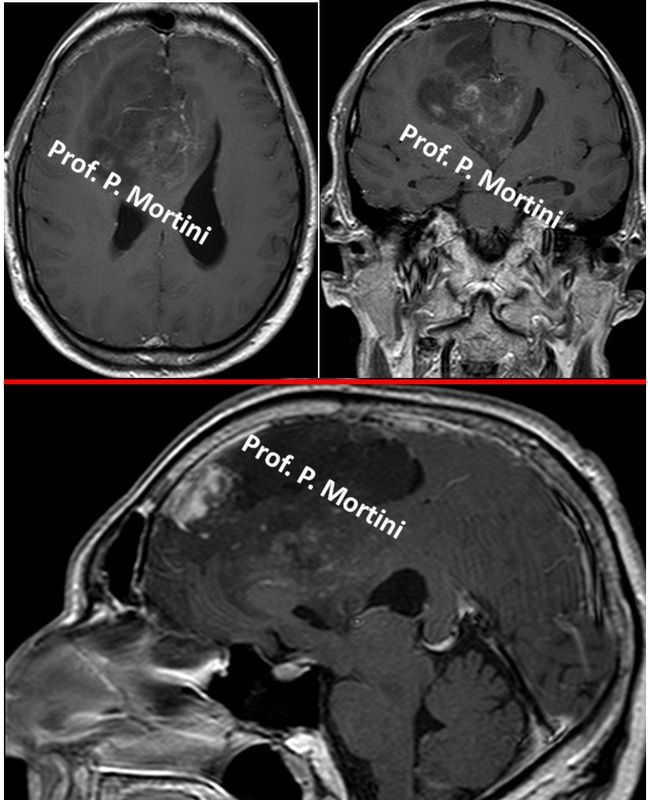 In addition, some smaller tumors may be treated effectively with stereotactic radiosurgery, which involves the use of a highly focused beam of radiation to target the cancer cells specifically and leave the surrounding brain unaffected. The choice of treatment usually is made based on the grade of the tumor, which is a measure of the tumor’s malignancy. Some tumors, particularly those that are high-grade, cannot be treated by surgery and these are referred to as inoperable. If surgery is not possible your doctor will discuss other forms of treatment with you.